Cognitive computing has been one of our most exciting frontiers for years. It's enticing to think that we can someday build a computer that's as powerful and as efficient as a brain. IBM's latest miracle chip just got us closer than ever. Big Blue has married neuroscience and supercomputing to create a new computer chip that's the size of a postage stamp but boasts one million neurons and uses as little electricity as a hearing aid (about 70 milliwatts). It's called TrueNorth. 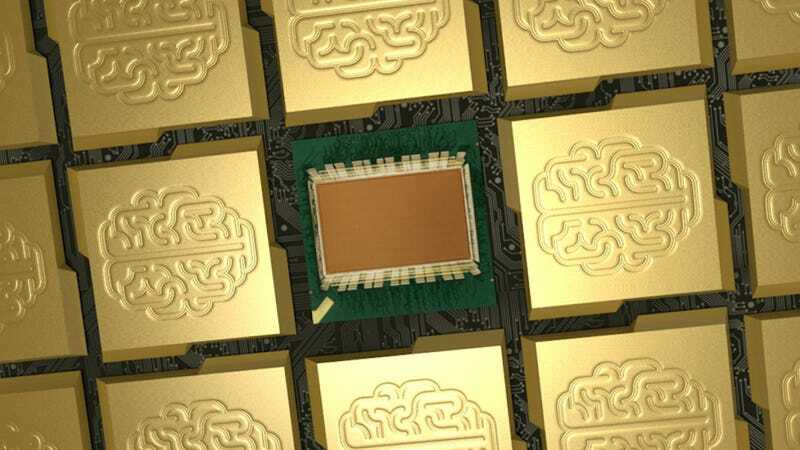 The chip is the second generation of cognitive computing chips that IBM has built in a decade-long effort to build a brain-inspired computer, with funding from DARPA's SyNAPSE program. To give you a sense of how big an innovation the new TrueNorth computer architecture is, you need to know that IBM's first-generation chip only had 256 neurons on it—and that was a big deal at the time. Want some more impressive figures? Whereas the first generation chip had 262,144 programmable synapses, the new chip has 256 million. The first generation chip had just one neuro-synaptic core. The new one has 4,096. These kinds of improvement spell great news for the applications of brain-inspired chips, which include everything from special glasses to help blind people to see to a tumbleweed-like robot that can perform search-and-rescue missions. The quantum leap in specs isn't just an indication of how much more powerful the new TrueNorth architecture is. It's also solid proof that this type of technology can scale. As you probably already know, the human brain is impossibly complex. And while we've seen plenty of systems that mimic the processes of the brain, the challenge of building a computer that matches the brain's raw processing power has proven to be, well, insanely challenging. Just last year, scientists hailed the success of one of the world's most powerful supercomputers matched just one percent of one second's worth of human brain activity with a whopping 83,000 processors. That said, according to Murphy's Law—which is still alive and kicking!—we should theoretically be able to accomplish the seemingly impossible task of building computers as powerful as the human brain by 2020. Yet even with IBM's new architecture, which integrates memory, computation, and communication to optimize speed, that deadline seems daunting. IBM's long term goal is to build a neuro-synaptic chip system with ten billion neurons that's no bigger than a two-liter soda bottle. So if you thought the jump from 256 neurons to 1 million neurons was big, IBM needs to make several more, even bigger jumps. The researchers involved in the project as well as those who could use this technology are nevertheless very excited about this breakthrough. "This is a huge architectural breakthrough that is essential as the industry moves toward the next-generation cloud and big-data processing," said Samsung's Shawn Han in a release. Dr. Dharmendra S. Modha, head of IBM's brain-inspired computing program, offered a more specific outlook, "These brain-inspired chips could transform mobility, via sensory and intelligent applications that can fit in the palm of your hand but without the need for Wi-Fi."